Coronet $10 Eagle production began in 1838 and continued until 1907. In 1870, the Carson City Mint in Nevada opened its doors for business, whereupon the minting of gold coinage became standard practice. Some of the rarest, most desirable coins in United States numismatics today were struck at Carson City. True scarcity and strong collector demand have teamed up over the course of many decades to drive the price of “CC” coins ever higher. One component of the demand is the allure of owning relics from the romanticized American Wild West era, exemplified to perfection by coins from the Carson City Mint. The 1879-CC Coronet $10 Eagle certainly fits into this discussion. Ten dollar gold coin production reached a low point at Carson City in 1879, due to dwindling bullion deposits and a work stoppage. In all, only 1,762 pieces of the 1879-CC Eagle were struck, and of that number, probably no more than 50 survive to this day. Yes, the 1879-CC really is tough to find. The red line above charts the progress of the Rare Coin Values Index, which reflects the composite percent change over time of a pre-selected group of 87 rare US coins. The baseline for the Index is Jan 2000. The purpose of the Index is to get an understanding of how well the overall rare US coin market is doing. 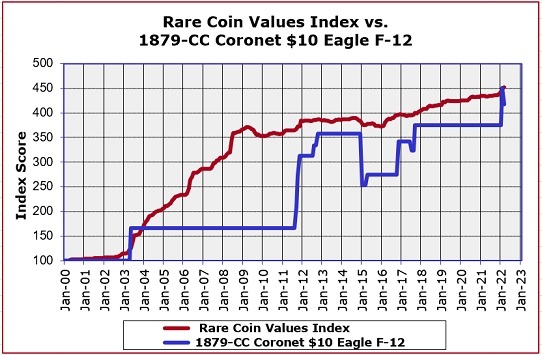 The 1879-CC Coronet $10 Eagle has underperformed for much of the same time period, as illustrated by the blue line. The 1879-CC is one of the 87 coins tracked in the Index. All data is updated monthly.